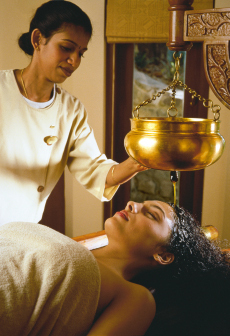 India`s best kept secret is its ancient therapies and treatments known as Ayurveda. This science of life evolved around 5000 BC and has brought wellness and true health with simple changes in living practices. The ancient system of medicine based on the goodness of nature to rejuvenate, replenish, recharge & cleanse body, mind and soul with medicated oil massages, spa treatments and herbal medicines. From the Ayurveda perspective, a disease is to be addressed as part of a whole, and each individuals physical and psychological needs are analised before any treatment. One can avail of the Ayurvedic rejuvenation facilities offered at many of the hotels / resorts while touring in many regions with us but specific treatments require at least a week after consultation with the Physican or we could book you into a specialist Ayurvedic Resort for the duration . 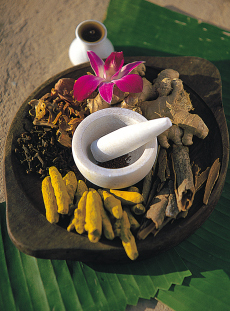 Ancient texts prescribe the monsoon as the best time for Ayurveda. The cool climate opens the pores of the skin to the maximum- making it more receptive to Ayurvedia`s oils and herbs. Propunded and propogated by Patanjali, Yoga is one of the six sytems of Indian Philosophical thought. The various elements of Yoga are designed to bring about the an equanimity of mind and equilibrium of the body. Practising Yoga relives one of mental stress and enables one to address life with ease and calm. Many of the resorts offer Yoga and Meditation in combination with Ayurveda. Open up to the vista of your inner self and nurture the equilibrium of movement and rest. Contact us with your requirement and we will be glad to book you into resorts that offer them while holidaying in the region.